A single three-hole punched spine binds 10 sheet protectors to help you keep frequently referenced pages together and in order. The top-loading design makes it easy to insert pages, and the acid-free, archival-safe material ensures your papers stay in pristine condition. The durable spine anchors the sheet protectors securely in your three-ring binder without tearing, so you can enjoy long-term protection and convenience. Product Number AVE-74301. I completely LOVE these bound protector sheets. There are 10 sheets in each set and I use them to hold my teaching materials together by subject. They are FABULOUS! I keep finding new uses for them and ordering more! Transcript: These are Avery Bound Sheet Protectors! They are a collection of protectors, held together by one thicker plastic binding. Your pages are inseparable. The binding is 3 hole punched to be used in a binder. And the pages slide in from the top. Your protected pages always turn together. Here is a last look at the ten pages held together. 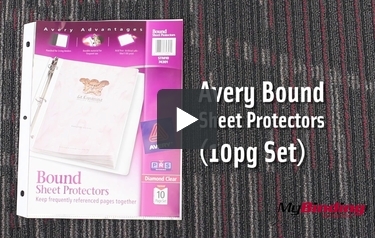 These are Avery Bound Sheet Protectors!